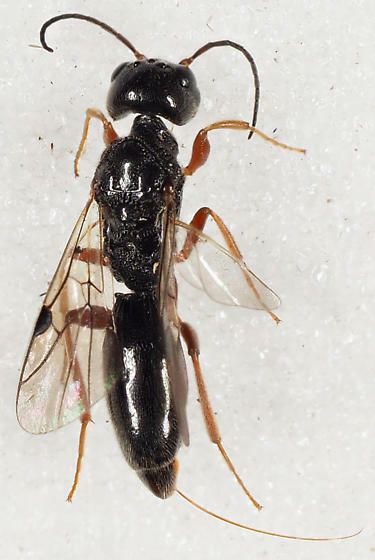 There is only 1 described species of Vanhorniidae in the USA- Vanhornia eucnemidarum, which is a parasitoid of Eucnemidae larvae in old dying trees. (There may be a second, undescribed, species in North America as well). Comparing it to the image in BG it sure does look like it. If there are any other pictures needed to aid in ID let me know. Thanks. The description mentions the size at 6-8mm, black, with reduced wing venation. The mandibles have their tips directed outward - not meeting when closed. The abdomen is elongate - the first segment occupying most of the abdomen. The antennae are 13-segmented. Hosts are false click beetle larvae (Eucnemidae) that are found in decaying wood of mature trees. There are currently two known species.